New research from the Max Planck Institute shows that nucleolar size correlates with health and lifespan in organisms as diverse as roundworms, flies and humans. Can a cell show its biological age? And is it possible to foresee an animal’s lifespan? 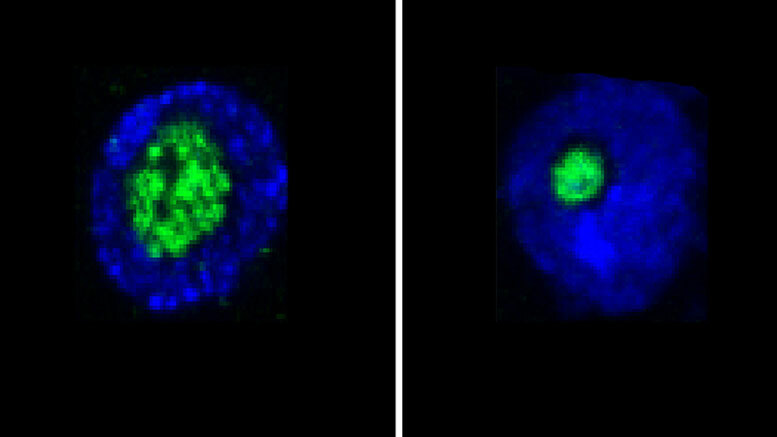 Scientists from the Max Planck Institute for Biology of Aging in Cologne discovered a connection between the size of the nucleolus – a tiny structure in the very center of the cell – and life expectancy. This could be used as a molecular marker for health and ageing. Ageing researchers have long been searching for so-called biomarkers of ageing, which allow predictions about health and lifespan of organisms. Varnesh Tiku, a scientist in the department of Director Adam Antebi at the Max Planck Institute for Biology of Aging, recently made a breakthrough discovery by studying long-lived mutants of the roundworm Caenorhabditis elegans. All of the mutants showed smaller nucleoli than their shorter-lived relatives, independent of the pathway that led to their longevity. The nucleolus is a tiny structure within the cell nucleus where special RNA molecules and proteins are assembled to form ribosomes, the protein factories of cells. The strong correlation between nucleolar size and lifespan enables the Max Planck scientists to predict whether the worm will be short-lived or long-lived. But is the reduced nucleolar size actually responsible for the increased life expectancy or is it just a read-out without being causal? “We think that the size of the nucleolus is not only a biomarker for longevity, but that the molecules within the nucleolus could causally impact life expectancy”, explains Antebi. The scientists already got a glimpse that this hypothesis is correct: They observed that long-lived mutants with small nucleoli also show reduced levels of a nucleolar protein called fibrillarin, which aids in the assembly of the protein factory. When fibrillarin was reduced, the roundworms lived longer. This suggests that levels of fibrillarin in the nucleolus regulate life span. But do these results mean that in the future we could go to the doctor, measure our nucleoli and estimate our life expectancy? “Perhaps, but there is still a lot of work to be done – more importantly, we hope that our discovery will help us to monitor interventions associated with increased health and longevity”, says Antebi. Be the first to comment on "Study Shows Nucleolar Size Correlates with Health and Lifespan in Organisms"